Navman iCN 550 has been discontinued. Accessories, spares and parts are still available for your iCN 550. 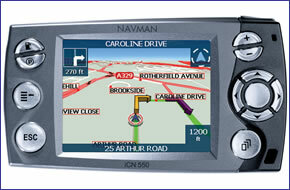 The Navman iCN 550 is the top-of-the-range GPS navigation from Navman. It is driven by the very latest SmartST professional mapping software and is crammed with features to make your motoring stress-free and more enjoyable. You have 5-digit postcode address search, 3D map and mini-map view, Back-on-trackT rerouting and 'Avoid area' traffic avoidance. A new feature to SmartST is multi-stop journey routing which allows to to plan a route from A to B to C and so on. You can also import your own points-of-interest tailoring your Navman iCN 550 with particular petrol stations, safety cameras, sports grounds and restaurants. Fuel and Park buttons instantly tell you where the nearest petrol station or car park is located. A new optional Traffic Module* warns you in advance of traffic trouble spots ahead and allows you to choose alternative routes. Voice-guided navigation, touch screen and remote controls are all included as standard to make your journey easier. Ultimate Traffic Update: Always be one step ahead of the game. Avoid getting caught up in bad traffic and get the latest information about road incidents using TM 550 Traffic Module, an optional extra* for Navman iCN 550. With no subscription costs, you receive free access to the latest traffic data, allowing you to keep in touch with what's happening on the roads. The Navman iCN 550 has been designed to be Plug & Play, and as such can be transferred from vehicle to vehicle with ease by the user. The Navman iCN 550 is powered with a 12-volt adaptor cable in-car. The provided mains A/C power adaptor allows for use in the home or office, when configuring a route (cables included). The Navman iCN 550 works with Tele Atlas Maps to provide detailed maps of across Europe. Tele Atlas Maps provide high quality, detail rich maps, which in addition to street information include features such as route calculation, Points of Interest, Estimated Time of Arrival, and more. Although the Navman iCN 550 has been discontinued, a number of accessories are still available to buy from ActiveGPS. These accessories and spares include: windscreen mounting bracket, traffic alert pack, remote control and external GPS antenna. View all Navman iCN 550 accessories and parts here.